This won the internet for me today. Maybe this week. Maybe this year. It may be the best thing I’ve seen since the Macaulay Culkin picture. I used to use Haha (or hahahaha or BAW Hahaha! ), and scoffed at those who wrote Lol. Then someone I love (my sister) would use lol all the time in texts & I got used to it. Now I use both. I’ll use lolz & zomg, but not the lmbo (or lmao, which I find inappropriate, but that’s because I’m a lady). Sometimes, it really does take just knowing someone who you love to make you more tolerant. Like Sen. Rob Portman and his son. Sometimes, when something tickles me so, I’ll use ROTFLSHMSFO (rolling in the floor, laughing so hard my sombrero fell off). Ok, so not much to report, so I’m just gonna show some link love. Can you tell I’ve just had a 3-day weekend? That means time to surf the internets. Danger Mouse is in a legal battle w/ his label; so his next album is a 100+ book w/ a blank cd-r enclosed. Feel free to pirate. 10 things you never knew about the Eiffel Tower. The breakdown of the average student budget. 100 obscure & remarkable cd covers. Top 100 Comic Book Villains of all time. 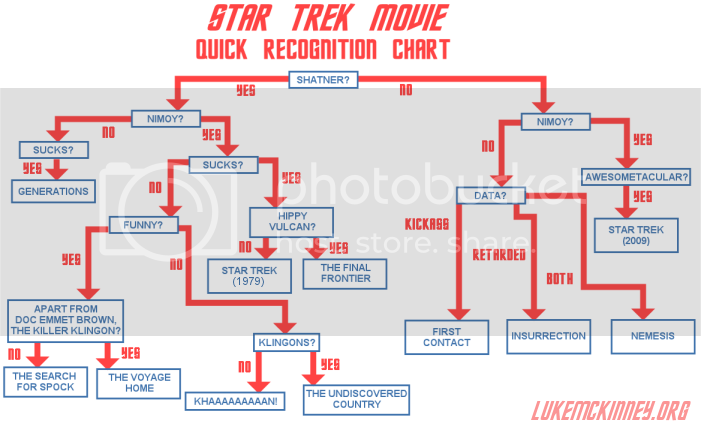 Find the right Star Trek for your movie watching needs. How big is the new Enterprise compared to the old one? And this. Le piece de la resistance. If you didn’t click on any of the links above, but you enjoyed either Star Trek OR Star Wars, you need to check out this youtube vid. First, Henson’s 11. It’s the Ocean’s 11 trailer, complete w/ the audio from the original 2001 trailer, only w/ Jim Henson’s MUPPETS!!! photo by flickr user hughroper. Next, a post off of Boing Boing, about efficiency gardening. Less space, no weeds, bigger plants, less seed. It seems like a win-win situation! No tilling the soil, & it aerates itself. The pic is hyperlinked to the article, & you can always visit the Square Foot Gardening” website. It was created/developed by an engineer turned gardener. Of course. I don’t wanna hear about how great you are, or how “great you is“. Show me, tough stuff. oh, wait… you’re not tough stuff, you’re a sensitive lil pansy. You get all bent outta shape if someone makes a “yo mama” joke. Maybe it’s b/c of all the steriods you take, b/c you need to look buff when you take your shirt off. They make you all moody & whatnot? Rappers will react badly, & take sh*t too personal. News Flash: It’s not all about them. Man, that’s right…. they think it *is* all about them. They are just as much divas as Mariah, J-Lo, or Madge. Many demand the type of smoke that really is only legal in Amsterdam right now. Pharell needs 20 crates of Grey Goose & Bacardi each, 15 magnums of Perrier Jouet Belle Epoque champagne, & a Rolls Royce on hand in case he wants to run around town. I forgot the belly dancers he requests to entertain them whilst they’re getting their drink on. There was a time when a Rap meant something. Said something. & that thing wasn’t about your new sneakers & your fetish about having fresh clean white ones. Ppl were trying to bring issues to light. They wanted you to get mad, or upset enough to do something. RATM even has action links on their site, for ppl to get involved; as well as a parental link (for those parents that may still care to be involved in their kids’ lives). I don’t want to hear your own personal battles; how you’re better than that dude. Then that dude puts out a song about how he’s better than you. Sort it out yourselves. Or don’t. I don’t care. Agree to disagree. You’re adults. And another thing. Y’all have moms, aunts, sisters, girlfriends. You respect them. What’s wrong w/ saying that once in a while? Common’s The Light shows us that he’s harder than many other rappers just cause he can say what he says, strongly. If rap is now folks like Lil Wayne*, & this Flo Rida** character, rap’s dead. You already know how I feel about lil Wayne, after he compared his “greatness” to that of the late Martin Luther King Jr.
Show some respect. & pull your pants up. What inspired this? You have to watch the video below. I love hip hop. The really good stuff. But today’s rap’s just an infection. I was so ready to make a video & send it in for a t-shirt (the things we’ll do for a free t-shirt, what can I say? ), but it ended on March 30th. oh, & don’t watch the vid @ work, unless your work doesn’t care about the F-word & N-word being tossed around like Karrine Steffans. If anyone asks where I’ve been, I wasn’t shopping for things I don’t need. I’m preparing for my flight to Chicago tomorrow morn. 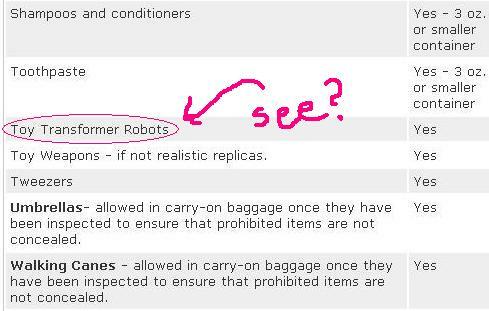 I figured I’d check the TSA guidelines so that my precious (expensive) toiletries don’t get poached from me. So, I go to the TSA regulations site. It’s really cute, it’s called “TSA: What to Know Before You Go”. See? Cute! It rhymes. This is when I discovered that my 4 oz “travel-sized” hair gel is not allowed, the container must be 3 oz or less. Criggity. ….. and then I see this, just under toothpaste….